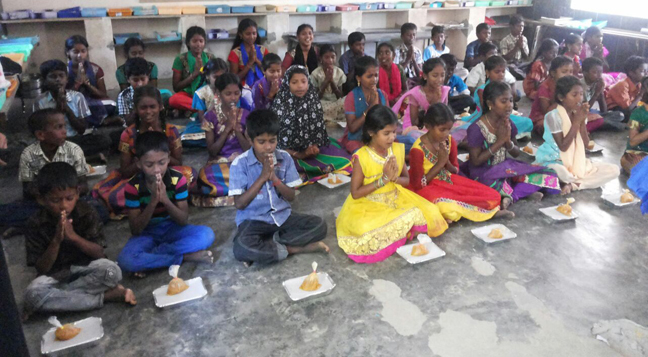 Tharani is an 8th grade student at Atchampatti HoPE Learning Center in Tamil Nadu, India. She enjoys learning about Phonemic Intelligence, Nutrition, and Yoga. Her goal is to become a nurse so she can encourage and uplift the patients in her care. She recalls watching her uncle die of cancer. Despite good medical treatment, he lost hope after a nurse told him to give up. All the children in Tharani’s class are excited about Diwali (an Indian holiday with the cultural significance of Christmas in the West), which is held on the darkest new moon night of Kartika. Since Diwali is The Festival Of Lights, millions of lights all over India decorate houses and rooftops in celebration. One of the most popular festivals of Hinduism, it spiritually signifies the victory of light over darkness, good over evil, knowledge over ignorance, and hope over despair. As part of the traditional celebration children are customarily given new clothes, but the poorest families cannot afford them. Not receiving new clothes like most other children causes great shame to many poor families on what should be a joyful day. Fortunately, due to the generosity of our sponsors, Tripura Foundation has been able to provide new clothes for our HoPE Center children and holiday feasts for their families. On behalf of 4040 wonderful kids like Tharani, please consider making an additional heartfelt gift to provide food and clothing during this Festival of Light. Even $10 can bring HoPE and further banish the darkness of poverty for young people like Tharani.